Turn your home into your vacation paradise... Five Star Ponds will show you how with our complete line of do-it-yourself and professional water garden and pond products. There is nothing more relaxing than coming home from a hard days work and hearing the sounds of falling water in your own yard. Instead of flipping on the television, walk outside with your family and enjoy the paradise created in your own yard. Five Star Ponds specializes in designing and installing natural, easy to maintain ponds, waterfalls and streams in the Orange County California and Austin Texas areas. For customers outside our areas, Five Star Ponds also offers a complete line of Aquascape products for installing your very own paradise on your own. 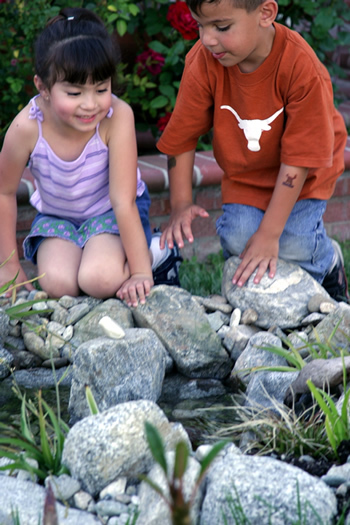 Kids love ponds and streams. They provide instant entertainment while allowing opportunties to learn about ecosystems. 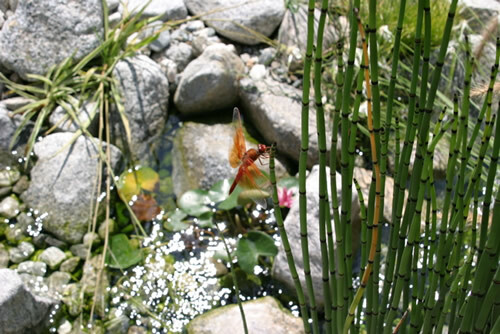 They will delight over visitors that may take residence in your water garden like dragonflies or frogs. If you are only interested in the sounds of falling water and streams, we also offer the pondless waterfall option. This is perfect for public settings and small children. Take a look at some of the ponds in the Orange County, CA area in our water garden pond gallery. This dragonfly visits the stream daily.